Take off from Lake Hood, the world’s largest seaplane base for a spectacular seaplane adventure! 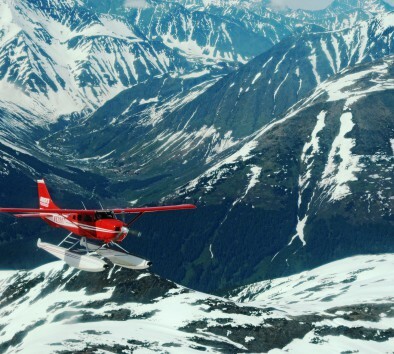 Experience a true Alaskan mode of transportation while enjoying an aerial view of Anchorage and its surrounding wilderness. You’ll soar over the magnificent Chugach Mountain range surrounding Anchorage and through remote, secluded valleys over Turnagain Arm, named by Captain James Cook. Return to Anchorage and enjoy a bird’s eye view of the skyline and mountains before a thrilling water landing. Dress in warm layers. Bring your camera and sunglasses. Travel time is approximately 45 minutes each way. Flight time is approximately ½ hour.